da Vinci® Hysterectomy – Are You a Candidate? A hysterectomy–the surgical removal of the uterus–may offer a life-saving treatment for serious conditions such as cancer or uncontrollable bleeding. In most cases, however, a hysterectomy is an elective procedure to relieve chronic pain, bleeding or other disabling conditions that may be caused by fibroids, endometriosis or prolapse. 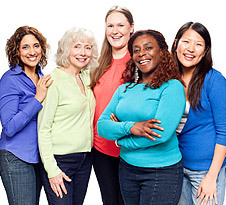 If your doctor recommends a hysterectomy, you may be a candidate for a new, less invasive surgical procedure called da Vinci hysterectomy, which uses a state-of-the-art surgical system designed to help your surgeon perform a more precise, minimally invasive procedure. da Vinci® Myomectomy – Are You a Candidate? A uterine fibroid is a common type of benign (non-cancerous) tumor that develops within the uterine wall. Uterine fibroids occur in up to one-third of all women and are the leading reason for hysterectomy in the United States. Uterine fibroids may grow as a single tumor or in clusters. They often increase in size and frequency with age, but then revert in size after menopause. Symptoms include excessive menstrual bleeding, pelvic pain and infertility; however, not all women with fibroids experience symptoms. A common alternative to hysterectomy is myomectomy, or surgical removal of uterine fibroids, which preserves the uterus and may be recommended for women who may later want to become pregnant. After removing each fibroid, the surgeon carefully repairs the uterus to minimize potential bleeding, infection and scarring. Proper repair of the uterus is critical to reducing the risk of uterine rupture during pregnancy.